I took the photo in the car this week. I was afraid that if I left it until after meeting with some friends for dinner, I would have nothing to show you but badly wilted veggies. Thankfully, the car stayed relatively cool and my only casualty was my lovely sunflower. 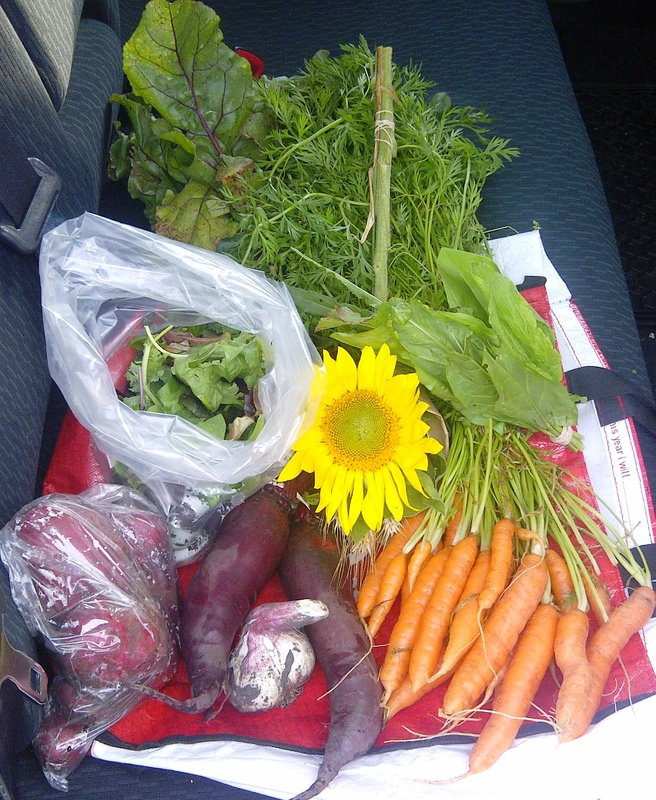 This week, we received Red Potatoes, mixed greens, a bulb of fresh garlic, beets, carrots, our choice of sorrel or chives and a glorious sunflower. We were “suppose” to get zucchini too…but perhaps they jumped the gun when sending us our weekly update. I don’t want to chuck my sunflower….but does anyone know if you can revive it? She’s droopy! My those are funny shaped beets! Hope your sunflower survived the night – water can work miracles! Looks delish! Never seen beets shaped like that before.